A study of the similarities between Hinduism and Ancient Egyptian Religion. Considering the enormous geographical distance between India and Egypt, ancient Egyptian religion and modern Hinduism have a surprising number of similarities in concepts and practices. 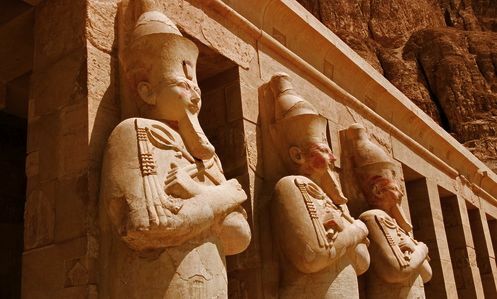 This is not to say that other polytheistic religions do not have similarities with each other or with ancient Egypt but not in what appears to be such abundance as between ancient Egyptian and Hinduism. A number of religions do have similarities with Hinduism, such as Buddhism (which was born from Hinduism), and some African belief systems, but as Hinduism is one of the six main world religions the comparisons between this vibrant religion and a long-extinct ancient religion are interesting. Aspects of Hinduism can be traced to the Indus Valley Civilisation (approximately 2500 BC), when it was at a cultural high point, through the archaeological record, although this religion is not recognisable as the form practised by Hindus today. The Indus Valley Civilisation and their religion is contemporary with the Egyptian Old Kingdom and the religion of the ancient Egyptians was in a fully developed form. How the ancient Egyptian religion developed is unknown as no written records of these developmental stages. Hieroglyphs were not introduced until approximately 3100 BC on the Narmer Palette whereas the Indus Valley civilisation has written texts dating to prior 2500 BC, from the Mohenjo-Daro region. Unfortunately this language has not yet been deciphered (Brockington 1996, 24) and therefore the contents (religious or otherwise) are unknown to us. However, it is likely that some elements of the Indus Valley religion may have become absorbed into that of the invading Aryans (2500-1500 BC) and therefore into modern Hinduism. The Aryan invasion of India instigated a decline in the Indus Valley Civilisation, and a loss or absorption of the traditional religion into that of the Aryans. The Aryan race recorded their beliefs in Sanskrit, which has been deciphered and has produced a number of religious texts; which are still important to modern Hindus. The earliest known Hindu texts are the Vedas written in approximately 1500-1000 BC (Brockington 1996, 7), which are primarily concerned with the elemental gods (e.g. fire, sun, wind and storms) and the ritual of sacrifice and cosmic balance. The earliest written religious texts in Egypt, are the Pyramid Texts from the pyramid of Unas (2375- 2345 BC) approximately 1000 years earlier than the Hindu Vedas. Both the Vedas and the ancient Egyptian religion were passed down orally for generations but only remained in a fixed form once they were recorded. However the Vedas, although passed down for centuries through oral tradition, were considered too sacred to permanently record (Brockington 1996, 8) indicating the traditions may have existed for as long as the Egyptian beliefs if not longer before being recorded. Like the Vedas, and indeed many early belief systems the gods of the Pyramid Texts are elemental as the sun (Re) is the primary deity of these texts, although there are also many references to the stars, the river and the environmental elements involved in the creation stories, where deities of the sky, earth, air and moisture are the first created by the sun god (Hart 1990, 10-8). However most religions include doctrine to explain the local environment and this alone cannot form a basis of comparison between two religions, other than on a very superficial basis. Thorough careful examination of the creation stories and other myths further comparisons can be made to support similarities between the two religions. There is often a great deal of confusion about the nature of the pluralistic nature of the ancient Egyptian creation stories. There are a number of variations on the story but the basis for all of them is the Heliopolitan myth of creation; all the variations follow this element of the story almost as if this was the ‘original’ legend. There are however numerous elements of the Heliopolitan myth and the Hindu myths which correspond. Before creation the universe consisted of primordial waters, with no light and no movement. It was a time of chaos, nothingness and darkness, until from these waters the creation of the Universe began. This description could refer to the time before creation in both ancient Egyptian religion and Hinduism. The ancient Egyptians feared the world falling back into this primordial chaos and this fear saw the development of the solar cult; worshipping the sun ensured the daily cycle of the sun would continue. If the sun failed to rise, Egypt would be plunged into darkness and return to this primordial chaos. For modern Hindus this idea of primordial chaos is also a very real although an inevitable one. They believe that the earth is in an era called the Kali Age (Yuga), which will last for 4,320,000 years (Zimmer 1974, 15), at the end of which the universe will be destroyed and reabsorbed back into the Supreme Deity residing in the primordial waters. After a further prescribed number of years he will then start the creation of a new Universe. The time cycles here are not being compared as the Egyptian solar cycle was a daily event, and the Hindu yugas last for thousands of years. What is being compared is the potential of the Universe reverting to a state of primordial chaos; a time of darkness, primordial water and nothingness. For the Egyptians this could happen if the sun failed to rise and was therefore a daily threat on their lives. In the Book of the Dead (spell 175) the creator god Atum describes how he will “destroy all that I have made; the earth shall return to the Abyss, to the surging flood, as in its original state; but I will remain with Osiris” (Faulkner 1972, 175). This indicates that once the earth has reverted back to the primordial chaos it will remain in this state, with no hope of new life, until the sun (Atum) decides to leave the underworld (Osiris). This catastrophe could be averted by rituals, prayers and offerings to the sun god, and there were specialist “Hour Priests” whose role was to ensure that the rituals and prayers were carried out at specific times of the day. For Hindus, reverting back to this primordial chaos cannot be avoided as they believe that at the end of the current yuga the Universe will be thrown back to primordial chaos, and is an inevitable event, which prayer and worship cannot avert. Once the current yuga has ended the whole creation process starts again. At the dawn of time the Supreme Deity, Vishnu, lay recumbent in the primordial waters and as he awoke the creation of the Universe began. Creation started with a lotus flower, sprouting from his navel, and Brahma, the deity of spiritual awareness and consciousness, is seated in the centre of this lotus. This lotus flower then splits into three petals creating the earth, the sky and the abode of the gods. The outer petals are the inaccessible continents of foreign people and the underside of the petals are where the demons and serpents reside (Zimmer 1974, 51-2). Goddesses in Hindu art are also often shown standing in a lotus, representing self-creation and their fertility aspects. Through these associations with fertility and creativity the lotus in Hinduism is thought to be connected to solar deities, and in early mythology the lotus is closely associated with Surya the solar god (Goodyear 1891:5), or Vishnu who represents the sun and the first dawn of creation. In Egyptian mythology the lotus is also connected to fertility and associated with solar deities. In the creation myths f a mound of earth rose from the primordial waters and on this mound sprouted the first flower, which in some records is a lotus flower. 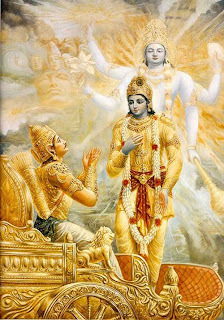 From this lotus the sun rose, starting the first dawn, and the beginning of all creation (Lurker 1984, 77-8); very similar to the story of Vishnu’s creation of the Universe. In Egyptian art and architecture this mound is often depicted and represents fertility and new beginnings. People are often show making offerings of lotus flowers to the gods, and holding and smelling them at funerary banquets, due to the role as an aid in rebirth of the deceased. There are also images of the king emerging from a lotus flower as the sun god and therefore the creator of the Universe; a direct parallel to Brahma emerging from the flower at the dawn of creation. The most famous Egyptian representation of this is that of the wooden head of Tutankhamun emerging from the lotus flower resting on the mound of creation. As the lotus flower was a common flower in the environment of the ancient Egyptians and early Hindus the importance of this flower may have developed independently of each other; although it is very interesting that the two religions should have very similar ideology associated with the lotus. It was suggested by Goodyear (1891; 191) that the lotus imagery reached India in the third century BC, and started to appear in the imagery. This is the time when there is clear evidence of contact between Egypt and India, and one nation could have influenced the other although the lotus forms in each region is different and they are depicted in very different manners. In order to keep the Universal equilibrium balanced it was essential to uphold the cosmic laws, through correct and moral behaviour. This statement again could apply to both religions, as they both have a concept of cosmic law, truth or balance which needs to be maintained in order to uphold the universal equilibrium and prevent the laws of chaos from gaining control. In ancient Egypt this cosmic law was called Maat and was personified as a goddess with a feather, the symbol of truth and righteousness, on her head. The most famous usage of this feather is in the ‘Weighing of the Heart’ ceremony in the Hall of Judgement (Book of the Dead spell 125). Here the newly deceased’s heart is weighed against this feather, and if it balances they are reborn into the afterlife. If it does not balance the creature Ammut, standing nearby, will pounce and devour the heart making it impossible for the deceased to be reborn, resulting in an eternal death (Quirke 1997, 66-7). As this concept of cosmic balance was so central to the beliefs in the afterlife, the concept of Maat also became essential to the everyday life of the Egyptians. 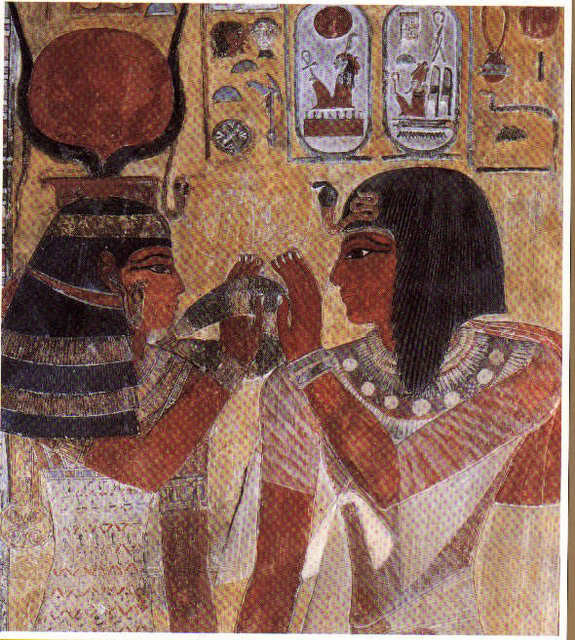 The king in particular had to uphold the law of Maat in order to prove his worthiness as king. His main role was to ensure that order was always maintained and that the forces of chaos (e.g. foreign invaders, natural disasters) did not govern during his reign. Each king had a set of tasks that he would try to perform to prove his worthiness and his maintenance of order. These would have included extending the boundaries of Egypt, improving on the works of their father and producing a male heir. These tasks needed to be done to appease the gods who would in turn favour Egypt and allow order and prosperity to reign. Many kings are shown in temple and tomb decoration offering a small figure of the goddess Maat to Amun to show that they live by her rule and that they are governing Egypt fairly and justly. Any kings, who went against the principle of Maat, were erased from the king lists and therefore from history by those who ruled after them. Examples of these would include Hatshepsut the female pharaoh, Akhenaten, who abandoned the gods, and any foreign rulers. Egyptian kings did not want to be connected to those that went against the law of Maat. King lists in general were used to connect the current king to the deities who ruled Egypt at the beginning of time. King lists used in India of the 4th -12th centuries AD were also used to connect the kings of the Mahabharata (text from first millennium BC) with Manu, the first man (Brockington 1996, 192-3), which would also prove their right to rule as well as their divinity; indicating that the ideology of divine kingship was similar in ancient India and ancient Egypt; although that will not be discussed here. In the same way that Maat was an important concept in the lives of the ancient Egyptians, in the Hindu religion the concept of universal cosmic law is known as rta. 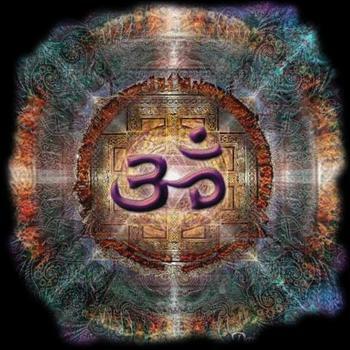 Rta has many meanings including order, balance, harmony, law, unified life-energy and the principle of intelligence. If you live your life, as a modern Hindu, according to this cosmic law, it will lay the foundation for morality and intelligence. Everyone has to uphold this cosmic law, gods included, or face the disturbance of the universal equilibrium. To make it easier for this concept to be understood by the individual the everyday Hindu lives according to their personal dharma or duty (Fowler 1997, 105-6). Dharma means “what is right”, and constitutes the specific duties that needed to be performed, according to your caste and stage in life. Even though this is sometimes difficult, if all Hindus uphold the laws of personal dharma, the more universal concept of rta is maintained. If dharma is not carried out correctly, the larger concept of rta is not maintained and the universe will fall into primeval chaos before the end of the kali yuga. In the Bhagavad Gita (18:47, 3:35), it explains in detail how it is more important to carry out your own dharma even if it seems unimportant than to try and carry out the dharma of another. In the Ramayana, Prince Rama was exiled by his father for something he did not do for fourteen years, but he had to go as his dharma states he should obey his father. Even after he was called back to the palace by his brother, he insisted on staying in exile until the fourteen year period was over. For this reason in the Hindu community Rama is viewed as a virtuous god who Hindus try to emulate. It is clear that both maat and rta are very similar concepts although maat is something primarily governed by the behaviour of the king, and rta is maintained by everyone through the practice of dharma. The main similarity between ancient Egyptian religion and modern Hinduism is their polytheistic nature. Both religions have one Supreme Deity, who is seen as the creator of all life. However both religions have a choice as to which deity they chose to worship in this role. The choice of Supreme Deity is often related to political events and is often the state god. In ancient Egypt the Supreme Deity was either Amun, or Ra, (or the Aten in the Amarna period) and in modern Hinduism the Supreme Deity is Vishnu, Shiva or Brahma. Although both Hindu gods and Egyptian gods exist in their thousands, each is a manifestation of the Supreme Deity and it has been argued that both religions have a monotheistic element. 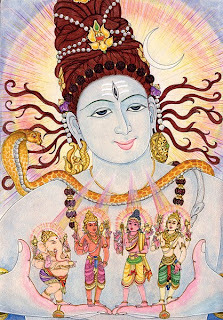 As the Supreme Deities are too complex or too powerful for many ordinary people to comprehend and bring into their lives on a personal spiritual level, they take on different forms, each with different personalities or characteristics, which can be approached for particular things, appealing to different people on many levels. For example Sekhmet, the lioness headed goddess, in ancient Egypt was addressed to cure illnesses (Lurker 1984, 106) as the goddess of epidemics, and in Hinduism before embarking on an exam or a business venture you would make an offering to Ganesha the elephant headed god of removal (and placing) of obstacles (Kanitkar & Cole 2003, 31). The gods however held different roles within the two cultures as the concerns of the population was different due to landscape, social and climatic differences. It has been stated that both religions are in fact henotheistic religions, that is, the worshipping of one chosen god over others. However many Hindus would argue that all gods are in fact a part of the Supreme Deity and therefore essentially the same. 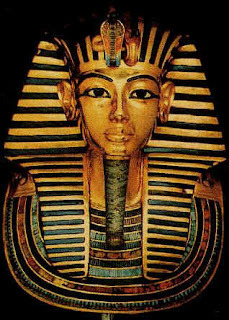 In the Memphite Theology describing the Egyptian creation the god Ptah is said to be present in “everybody and is in every mouth of all the gods, all men, all cattle, all creeping things that live” (Allen 1988, 43) and indicates that the ancient Egyptians also argued that one god could be present in all other deities. This debate of One God or Many is one that will continue. As in ancient Egypt, the Hindu gods have many myths about their lives, relationships, battles and killing, although for both religions it is impossible for a god to actually be killed. They are killed for the purpose of the story but this death is not a permanent state. A perfect Egyptian example is the dismemberment of Osiris by Seth. Although his body parts were scattered the length and breadth of Egypt, Isis and Nephthys were able to resurrect him. After he had impregnated Isis, Osiris became the god of the Underworld, not dead but not permitted into the land of the living. There is also a dismemberment story in Hindu mythology, when Shiva’s consort Sati died. In his grief, Shiva carried her body the full length and breadth of India. The other gods saw he was inconsolable and decided that he needed to part with the body of his wife in order to grieve and to continue with his life. Vishnu decided to cut up the body of Sati, until there was nothing left in Shiva’s arms. Shiva then retired to a mountain to meditate. Although his wife Sati was dead and dismembered she was reincarnated into Parvati who managed to persuade Shiva to marry her (Doniger O’Flaherty 1975, 249- 51). In both the Hindu and Egyptian mythology in many places where the dismembered body parts fell onto the earth, there arose a sacred centre or temple, and although the motivation for the dismemberment is different there are clear similarities. Despite the stories’ differences, the deceased in both were reborn into another form, Sati into Parvarti and Osiris into the god of the Underworld. Gods do not die in either religion; they move on and live again. Another Hindu story seems to have been inspired by the Isis/Osiris mythology, and even has the resurrection of the dead god rather than the rebirth, which is a completely un-Hindu idea. The Goddess in this story is Pattini and her husband Palanga is killed. Pattini searches for his body in the same way that Isis searches for the body of Osiris. When Pattini finds her husband she laments over his death, and the power of her grief resurrects him whereas Isis has specific personal powers of resurrection (Fynes 1993, 381-2). Although the stories are slightly different, the similarities could suggest an adoption of ideas. “You bring forth the flood tide of rivers, in Egypt of the Nile…………in India of the Ganges” It is suggested that although written in Greek it may have been a copy of an earlier text (Fynes 1993, 389), indicating that Isis may have been present in India earlier than the Roman period, brought here by traders and merchants. Another similarity between the religions is in the relationships that the gods have with each other. In both religions most male deities have a consort or wife and in Egyptian religion in particular form family groups and genealogy. Some of the major deities in Egypt have a “token” consort who do not necessarily hold much importance in the grand scale of the pantheon (Amun/Mut (Karnak), Khnum/Anukis (cataract region), Sobek/Hathor (Kom Ombo), Seth/Neith (Pyramid Age)) and the only major god without a consort is Horus, although he is often worshipped alongside his mother Isis; therefore creating a male/female partnership. It is likely that as Horus and Khonsu are divine children their relationship with their parents is more important than any relationship with a wife/consort. The general idea behind these relationships is that everything needs a male and female element to be whole, as the females represent the creative power and energy needed for birth and creation. The importance of this female element of the gods in Hindu imagery is sometimes represented by the god being shown as half male and half female. In Egyptian religion this creative element to the divine couples is represented by the production of a child as a means of completing a family unit. 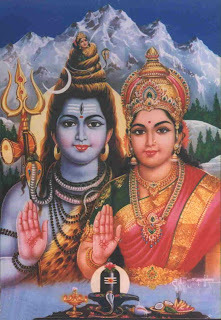 In addition to this idea of the duality of male and female characteristics a further similarity is suggested through the worship of dual snakes. DuQuesne suggests there was a similarity between the uraeus in ancient Egyptian kingship ideology and the the tilaka (red dot on the forehead) in Hindu practice, as they appear in the same position. In Indian tantric rituals the power of enlightenment is reached through the chakras; one of them being in the same position as the tilaka and ureaus. The tilaka represents the third eye of Shiva, providing the protection and enlightenment of the god, and the ureaus represents the goddesses of Upper and Lower Egypt, and places the wearer under their protection. The similarity is slight but interesting. The snake presented in the uraeus, is also an image of importance in Hinduism and Indian tantra. “Serpent power” in tantra is known as Kandalini and is represented by two snakes, a red and white snake and through invoking this power can lead to enlightenment. These dual serpents are also present in the Egyptian religion and are called Mertygoddesses and are red and white, wearing the red and white crowns of dual Egypt, representing the completeness of Egypt (DuQuesne 1995, 55-62). However, although there are certain similarities it has to be considered that symbols as synonymous as a snake or the forehead could have developed independently of each other and do not necessarily suggest a borrowing of ideas. Worship in both religions also has similarities, with a temple dedicated to a particular deity, and shrines within that temple dedicated to other gods associated with the patron deity. The most important part of the temple in Hinduism and ancient Egypt is the inner sanctum, the main shrine of the patron deity and the centre of the temple. However in ancient Egypt the temples were closed to the public, whereas Hindu temples are open to everyone, and are often the centre of the community. The statues housed in the temples, were treated the same by both the ancient Egyptians and modern Hindus. Each morning the statue is “woken up”, washed, anointed, and given new clothes. 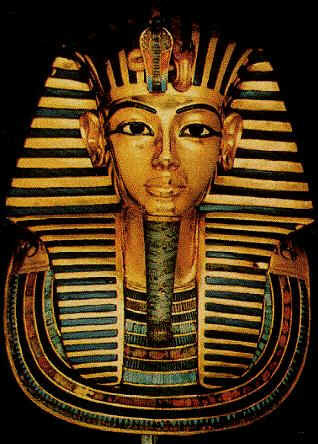 The Egyptians on occasion also applied cosmetics and perfume, before feeding the statue. In Hinduism this consists of fruit, flowers, or sweets, and in ancient Egypt it consisted of fruit, vegetables, meat and wine. In modern Hindu temples the god blesses the food and it is given back to the devotees to eat and is called prashad or ‘blessed food’ (Kantikar & Cole 2003, 9). In ancient Egypt symbolically the god ate the food, getting nourishment from it, and whatever is left was taken by the priesthood and eaten. This ensured the priesthood in ancient Egypt ate well, especially at festival times (Sauneron 2000, 23). At the end of the day the statue is again dressed and washed and given an evening meal, before being sealed in the shrine until the morning rituals. In Hindu religion rather than these rituals solely being carried out by the priests, in a temple environment, they are carried out on a daily basis in the home generally by the women of the household. Despite this more informal location the same rituals are carried out, including prayers, offerings and washing of the statues. In ancient Egypt there was also an emphasis on worship at home as the temples were unavailable to the general populace. Most of the houses at Deir el Medina for example would have contained a household shrine dedicated to local deities and the ancestors, and prayers and offerings were made on a daily basis. Another similarity between the religions are the processions through the streets of the statues of the deities. In the Hindu religion one of the most important things about worship is what is known as darshan, which means “to see”; the worshipper seeing the god and the god seeing the worshipper (Eck 1998, 3). This reflects an interaction and a relationship between the worshipper and the god and is something that has also been adopted by monotheistic religions as well. These processions in India are a way for many people to see the statue of the god and offer prayers and devotion to it, as Hindus believe the god is actually present in this statue for the duration of the procession and therefore it is important to take part. This is in fact one of the fundamental similarities between the two religions; the belief that the statue was not a representation of the god but in fact housed the spirit of the god and was essentially divine. In ancient Egyptian processions the deities were hidden in a shrine, so viewing the statue was not possible for the general populace. However it was considered important, and even an honour to approach the god, even in the shrine. They offered prayers and devotions as the god was carried past and it was also a time to ask the god for help in the form of an oracle, asking for advice and answers to various problems (Quirke 1997, 100). Although they could not physically see the statue they conversed with the god, albeit via the priests, but this relationship between worshipper and god was an essential part of the procession, and was an opportunity for the ordinary people to be close to their gods. There is evidence from the archaeological record that Egypt was trading directly with India from at least the Ptolemaic period, which was many centuries after both religions were fully formed, although evidence suggests there may have been indirect contact from an earlier date. During the pharaonic period spice may have been imported from India for use in the temples and a number of Indian products including indigo, and tamarind wood, bearing the names of eighteenth dynasty kings (Wilkinson 1994, 237) have been found in tombs. However this does not necessarily mean they were trading directly with the Indian continent. More concrete contact between India and Egypt comes from the sixth century BC when the northwestern part of India came into contact with Egypt when they both became part of the Persian Empire, although the extent of the contact is uncertain (Asthana 1976, 165). However it appears that during the Persian period (535-405 BC) in Egypt an Indian colony may have grown in Memphis (Asthana 1976, 170), a major harbour site and centre of trade in Egypt. The so-called ‘foreign quarter’ is believed to have been on the east side of the city near the river in order to be close to the trading harbour (Petrie 1909, 4), although it has also been suggested that the “foreign quarter” did not exist, but has only been identified as such due to a concentration of foreign figurines discovered in one place (Jeffries, 1985, 39). These foreign figurines including examples of Indian dancing girls which are thought to date to the first or second century AD and not the 300-200 BC date assigned to them by Petrie (Harle 1989, 375). These figures are similar to Buddhist carvings although the purpose of manufacture seems to be different; the Buddhist custom of modelling heads was to represent the people Buddhism was preached to, and then were presented at a great festival before being discarded (Gordon 1939, 37); the Indian dancing figures appear to have a different purpose. They show traces of colour (white slip and black, red, blue and green paint) (Harle 1989, 377), and it is thought these Indian dancing figures may be connected to the cult of Harpocrates, who is often shown with a side lock of hair, a finger to his mouth and wearing the double crown of Upper and Lower Egypt (Harle 1989, 377). These figures may represent an early androgynous form of Harpocrates or perhaps they could represent the dancing girls participating in cult ritual (Harle 1989, 383). This therefore suggests that there were Indians living in Egypt at the time these figures were manufactured. The earliest evidence of Indians physically present in Egypt is from a record of the royal procession of Ptolemy II Philadelphos (approximately 250 BC) (Gordon 1939, 37), which included Indian women, hunting dogs, cows and camels. 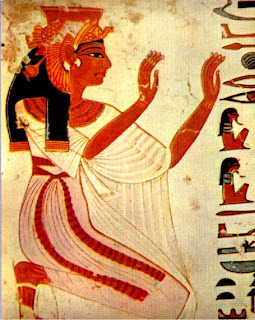 The Indian women included in this procession possibly resided in Egypt, and may have been the same women who danced for the cult of Harpocrates giving the procession an element of spirituality. The saloon in the yacht belonging to Ptolemy II was also lined with Indian stone (Asthana 1976, 189) indicating that there were definitely trade expeditions at this time to India. One of the most substantial indirect trade relationships was between Egypt and Mesopotamia and this started in the pre-dynastic period. There were two passable routes between Egypt and Mesopotamia, the northern route through Syria Palestine using both land and sea routes, and the southern route by sea through the Persian Gulf, around Saudi Arabia up the Red Sea to the Wadi Hammamat, then by land to Naqada (Mark 1997, 3). Due to increasing trade between the regions a third route was introduced via the eastern coast of the Red Sea in the late third to early second millennium BC. In later periods, trade routes from the Indian sub-continent throughout the Near East including Mesopotamia, Afghanistan and Syria, were also used by religious functionaries. The formed close links with trading groups, and this saw an exchange of ideas and the spread of Buddhism, Hinduism and Christianity. The cult of Pattini, for example, primarily worshipped by Buddhists and Jains and connected to the cult of Isis may have reached India via Roman functionaries. The Roman cult of Isis was then adapted into the cult of Pattini (Fynes 1993, 386). The other similarities between the ancient Egyptian religion and the Hindu traditions and practices could also be due to contact between these functionaries and Egyptian traders in the region of Mesopotamia, and possibly even Afghanistan during the earlier periods of Egyptian and Indian history. Evidence of direct trade between India and Egypt is clear from the late Ptolemaic and the Roman period in particular. Along the Egyptian Red Sea coasts, are various ports of trade, one of the richest in archaeological remains being that of Berenike. The trade passing through Berenike into Egypt were of a luxury nature and consisted of black and long pepper, fragrant roots and oils, indigo, coconuts, Job’s tears and teak wood that may have been used for ship building (Cappers 1998: 311 & 347-8). The teak wood, as an expensive import has only been discovered in the form of objects and not un-worked or charred (Sidebotham 2000: 133). It is also suggested that Sesame oil, produced from locally grown sesame seeds, were originally imported to Egypt in the early Ptolemaic period and domesticated. The cordia myxa (Indian cherry, or plum) a stone fruit has also been discovered at Berenike but may have been imported to Egypt during the pharoanic period, as evidence has been found at Saqqara dating to the third dynasty, and Deir el Medina from the eighteenth dynasty (Cappers 1998: 311 & 2000: 318) although not on an extensive scale. Non-food stuffs imported from India include in addition to teak wood, glass, semi precious and non-precious stone beads, cotton and pottery. There is also evidence of wheat being exported from Egypt to India which may have been destined for Egyptian traders situated there (Sidebotham 1998: 306) indicating that in the Ptolemaic and Roman period at least the trade may have been regular necessitating Egyptian envoys to be placed in Indian ports. Fynes suggests that it is via this trade that the cult of Isis travelled to India, in her role of “Goddess of the sea and navigation”. Her main cult was at Coptos, where goods were received into Berenike and then sent for distribution throughout Egypt (1993, 379). Indirect trade was a legitimate way for Egyptians to obtain goods from outside of their political jurisdiction and was common throughout their history. There are numerous Mesopotamian objects in Egyptian tombs from all periods indicating this relationship was maintained for many years. There are also numerous examples of lapis lazuli objects in funerary contexts from as early as the Naqada II period. These goods are found alongside other foreign goods, and they may have come along the same trade routes. The only source of lapis lazuli was Afghanistan, and whilst it was abundant in Egypt in this early period it appears to be rare in Mesopotamia and Palestine and therefore it may have reached Egypt via the Red Sea (Mark 1997, 38) perhaps through direct trade with Afghanistan. The archaeological record suggests that there was a Harappan outpost on the Amu-Darya giving access to the lapis lazuli mines of Sar-i-sang, Badakshan and the Egyptian expeditions may have had contact with them directly although evidence for this has not yet been found. The introduction of maritime trade saw the first direct contact between Egypt and India. Maritime trade in India started in the second to third millennium BC and was driven by entrepreneurs and a regular demand for coarse cloth, timber, and agricultural products rather than for exotic goods (Ray 2003, 82). Maritime trade in Egypt however only increased in the seventh century BC with the Greek settlement in Egypt and saw increased maritime activity between the regions (Mark 1997, 84). There are three maritime trading centres mentioned in Mesopotamian sources; Dilmun (on the Arabian Gulf in Saudi Arabia), Magan (southern Iran), and Meluhha (in Pakistan) and all are mentioned in a text by Sargon of Akkad (2334 – 2279BC). In the seventh century BC the neo Assyrian king also mentions these three trading places indicating a continued trade between the areas. DILMUN was one of the most important trading partners of Mesopotamia in the third millennium BC, and acted as a centre for the shipment of goods from further a field. The Indus weight system was possibly adopted from this region as it was known as the ‘standard of Dilmun’ by Mesopotamians suggesting continued contact. The main resource of Dilmun and the Magan region was copper, that the Mesopotamians traded for wool, silver, fat, milk and cereal products. As these goods are primarily ‘invisible’ there are very few Mesopotamian goods in the Indus Valley, although numerous goods have been found in Mesopotamia from this region (Possehl 2002, 227). Old Akkadian texts refer to the commodity lists of MELUHHA which include carnelian, lapis lazuli, pearls, wood, plants, fresh dates, copper, gold, cats and dogs (Ray 2003, 87), and carnelian and lapis were popular in Egypt throughout its history. A number of etched carnelian beads have been discovered in Mesopotamia, manufactured using a technique perfected by the Indus Valley Civilisation, although lost after the collapse of the civilisation following the Aryan invasion (Possehl 2002, 222). Again this indicates that the Mesopotamians were not just trading in raw materials but also in finished goods, and crafts. As Mesopotamia was trading with these regions, so close to India, and the Egyptians were trading with the Mesopotamians, an indirect route with India was available to the Egyptians, which could have included a trading of ideas, crafts in addition to commodities. Although it is clear from this study that there were numerous similarities between ancient Egyptian religion and Hinduism, the reasons for these similarities are uncertain. As a number of the similarities are environmental it is probable that these aspects of the religions developed independently based on their own environment and spiritual needs. There is enough evidence from the material culture to suggest that trade held an important part of the contact between India and Egypt, and shows the development of their relationship. This contact falls into three categories. 3 – Direct trade – with Egyptians travelling directly to India and Indians travelling to Egypt (Ptolemaic Period onwards). The direct trade started in the Ptolemaic period and then dramatically increased in the Roman period. This increase in trade saw the cult of Isis introduced to India, even if it was for the use of the Egyptian merchants residing in India; but then appears to have influenced the cult of Pattini, a local Indian goddess (southern India and Sri Lanka). This cult may have been exported intentionally from Egypt to India or may have travelled there via the religious functionaries traversing the trade routes with a mind for evangelism. Although at present no conclusions can be made regarding how much one religion may have affected the other, if at all, and it is possible that the similarities between the religions may be due to a combination of borrowed ideas and the natural, independent development of both religions due to similar environment and similarity of need. Ramayana itself has been proved by NASA findings of the Rama Bridge to be approx 1.9 Million yrs old when Vedas were recited by Rishis & even Ravana. You have stated that Egypt had its own scripts which were older than ancient Vedic India which was far more advanced than any other civilisation on earth. Egypt is not the leader in civilsation but it is Vedic India where we have given the world a great civilisation. Egypt & others only followed us. Wow i've never seen so many idiots in one location! Just like buddhas scriptures were handed down orally for 500 years before it was put into a book. But the vedic scriptures talk of the indus valley area which pre-date Egypt all together as the latest historical findings show. humans came OUT of africa down to india and spread out across asia and europe. any idiot that claims that india got its scriptures from the stories of Egypt really has no idea about archaeology and migration and human dna tracking. The Egyptians took the information from the vedic scriptures and just done their own thing with it, same thing what Buddha did and Jesus and Muhammad. I'm pretty happy with the view that Hinduism Pre dates ancient Egyptian religions but it is clear that there was some sharing of philosophy between the faiths. The philosophies between the Early and later Vedas as well as with modern Hinduism show some fluidity. In Fact: the Origin of Vedic gods and Egypt gods came from Pre-flood era - Previous Ancient Greece civilization. Pre-flood Egyptians(red race) learned from their neighbor - previous Greeks(White Indian race/Archaic Greeks/Brahmins/Etruscans/Sumerians/Babylonians). There was never an Aryan race just like Dravidian race - Max Muller dreamed up the cockamamie 'Aryan race' idea to win professorship at Oxford. Read his last letter to his wife - admitted as much to her. This was debunked 30 years ago - google it. Western Christian conversion industry continues to generate princely living for hundreds of thousands of people headed by illiterate television evangelical fraudsters - Ken Copeland, Benny Hinn, Pat Robertson, Joel Olsteen, Rick Warren, et. al. egyptian was not advance enough to comprehend abstractions and reasoning of philosophical literature like gita . According to hindu history, during satya yuga, dharma(hinduism) was 100%. In treta yuga it dropped to 75%. During dvapara yuga it was 50%. Name of earth was then mahabharat. Evil forces have always attacked sanatana dharma and they will always continue to do so. Slowly and gradually evil forces is succeeding in destroying mahabharat(earth), bharat(India) and hinduism(sanatana dharma). 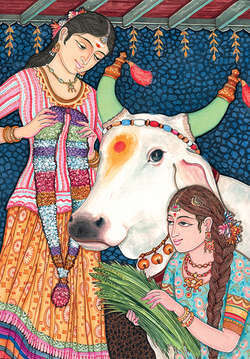 Before trying to understand hinduism and discuss about it, I recommend to strictly be vegetarian for at least 5 years! This is necessary to ban all demonic entities out of your body, mind and consciousness! By doing so hopefully you can see what you did wrong in the past and maybe you will be able to judge as a neutral creature! Let nobody deceive, fool and convert you in a very subtle way with the term 'hinduSTHAN'. Some basic clarifications and definitions about commonly occuring myths and deceptions regarding hindus!!! None religions such as jainism, buddhism or other invention, originated from hinduism(sanatana dharma)!!! All existing religions originated from forces with one main goal, that is to destroy, harm and wipe out hinduism(nature, animals, plants), their land, heritage, temples, holy rituals, cows, daughters, sisters, wifes, mothers, gods, goddesses, living style and incredable knowledges!!! Look at Bharat, 5000 year ago called MahaBharat(Earth), now renamed, falsified, nearly totally looted, destroyed, shrinked to small, tiny region and called India by evil flesh consumers, the same flesh, muscle power and brain power needed to build beautyfull temples and vimanas to cross the universe !!! Misunderstanding of hindu, hindustani, hinduism and sanatana dharma !!! All humans(black, white, yellow, red etc), demons and gods that are living according to the eternal, natural law(sanatana dharma = hinduism, which is not invented by anyone and is inherent to the universe), and are accepting Brahma, Vishnu and Shiva(=PashuPati) as the ultimate, true, divine, social authorities, are hindu and hindustani. Plants and animals are by nature hindu. Humans that are looking in the mirror and do think, I am looking like a general citizen(dark/brown skin, black hair) of India(Bharat), thus I am hindu, do have phantom pain(the pain and feeling when a body part is amputated by surgery). They amputated them self by their stupidity from hinduism. They do not live according to sanatana dharma rules, they keep eating meat and cows and they do not accept the holy trinity as the supreme, genuine authority. Even arya samaji's are not hindus, there main target as the other believers is to fool people and wipe out sanatana dharma from the universe, which is, as I can guess, impossible. They can wipe me and my loved ones out but not sanatana dharma!!! MahaBharat(Earth) War ( duration 432000 human years, kali-yuga duration ) started nearly 5113 years ago with help and guidance of Lord Krishna(Vishnu autar). All other Wars like WorldWar1, WorldWar2 and WorldWar3 are parts of MahaBharat War( War between divine and evil entities ). When hinduism is shrinked from 25%(beginning of kaliyuga,) to nearly 0%(end of kaliyuga, some 427000 years from now) then Vishnu will come again as Kalki autar to destroy all evil, plow the earth and flood the earth with holy water. During long period 12 suns will dry earth then next cycle of satya-yuga will start. Do your own NEUTRAL, HONEST study and investigation to come to this conclusion and to slow down this destruction proces made to hinduism, please hit the break whenever you see fit !!! as always said the cradle of life begins from south africa where the human born walk talk learn and found that means the infant shout and play and do all the things and same way the all begining from there today we may call darma, arts, science but without the bullock cart there is no transport on earth means on land, air, sea so the original religion came from south africa the black god called siva siva siva the siva lingam , the lord buddah born to hindu family, the jesusu inside the cattle shed the holy mecca is also originally from south african people so conclusion is the begining from south africa. Bhoomi Putra means son of the soil. I have not heard any religion by this name.Definitely India does not have it. May be some far east country has such religion.